Why are some substances biodegradable and some non-biodegradable? Some substances such as metal, glass, plastic, etc. which cannot be decomposed by the living organisms are non-biodegradable wastes. These substances are non-biodegradable because the micro-organisms do not have enzymes that can digest these substances. Therefore, we classify them as non-biodegradable wastes. Other substances such as paper, vegetable wastes, etc. that can be easily broken down by enzymes are biodegradable wastes. Give any two ways in which biodegradable substances would affect the environment. (i) The biodegradable substances such as tree leaves, plant parts, and kitchen wastes can be used as humus after composting. This will enhance the soil fertility. (ii) The biodegradable substances mainly contain carbon. These substances after decomposition release that carbon back into the atmosphere. Give any two ways in which non-biodegradable substances would affect the environment. (i) They contaminate soil and water resources as they cannot be decomposed by micro-organisms. (ii) These substances, when accidentally eaten by stray animals, can harm them and can even cause their death. What are trophic levels? Give an example of a food chain and state the different trophic levels in it. A trophic level is the level of species in an ecosystem on the basis of the source of nutrition such as producers, primary consumers, secondary consumers, etc. The producers form the first trophic level as they manufacture food. The primary consumers form the second trophic level, the secondary consumers form the third, and the tertiary consumers form the fourth trophic level. Various trophic levels are connected through food chains. For example, in an aquatic food chain, phytoplanktons are the producers, zooplanktons are the primary consumers, and small fish is the secondary consumer and so on. What is the role of decomposers in the ecosystem? Decomposers include micro-organisms such as bacteria and fungi that obtain nutrients by breaking down the remains of dead plants and animals. They help in the breakdown of organic matter or biomass from the body of dead plants and animals into simple inorganic raw materials, such as CO2, H2O, and some nutrients. What is ozone and how does it affect any ecosystem? Ozone is a colourless gas that acts as a screen for ultraviolet radiation. It is continuously formed at the higher levels of the atmosphere due to the action of UV rays on molecular oxygen. The high energy UV radiations break down O2 molecules into nascent oxygen. Then, this free oxygen atom combines with an oxygen molecule to form ozone. In recent years, the amount of ozone in the atmosphere is getting depleted. This ozone depletion causes a greater amount of ultra violet radiation to enter earth’s atmosphere. This has an indirect effect on the ecosystem. (Ecosystem includes both the biological community and the non-living components of an area). It results in the death of many phytoplanktons, thereby affecting the process of photosynthesis. Plants utilise atmospheric CO2 to make their food. In the absence of plants, the levels of CO2 in the atmosphere will increase, which would in turn lead to an increase in global warming. The depletion in the ozone layer also increases the frequency of infectious diseases as it suppresses the immune systems of both human beings and animals. The frequency of skin cancer also increases in human beings because of the direct exposure to ultraviolet radiations. How can you help in reducing the problem of waste disposal? Give any two methods. The problem of waste disposal can be solved by proper waste management including the collection, transport, processing, and disposal of the waste materials. 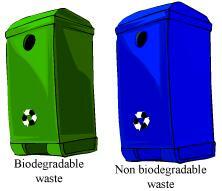 Use separate bins (blue and green) for disposing non-biodegradable and biodegradable wastes. Reduce the usage of non-biodegradable products such as plastics. Which of the following groups contain only biodegradable items? Which of the following constitute a food-chain? Which of the following are environment-friendly practices? What will happen if we kill all the organisms in one trophic level? Various trophic levels are connected through the food chains. If all the organisms of any one trophic level are killed, then it will disrupt the entire food chain. For example, in a food chain, if all the plants are killed, then all the deer will die due to lack of food. If all the deer are dead, then soon the tigers will also die. Due to the death of these animals, the decomposer’s population will rise in that area. This is just an example of one food chain. However, in nature, food chains are not isolated. They are interconnected in the form of food web. Therefore, killing all the plants of an area will not only affect the deer, it will also affect other herbivores such as goat, cattle, sheep, etc. Will the impact of removing all the organisms in a trophic level be different for different trophic levels? Can the organisms of any trophic level be removed without causing any damage to the ecosystem? Organisms of all trophic levels are equally important and are an integral part of the ecosystem. If all the producers are removed, then it will affect all the herbivores as it is their primary food source. Death of herbivores will soon affect the primary carnivores and so on. Now let us suppose that all the deer (herbivores) are killed in a region. This can lead to an increase in the number of producers. At the same time, there will be an increase in the number of other herbivores such as rabbits, goat, sheep, etc. due to less competition. This will also lead to the increase in population of only consumers of these increased herbivores. Thus, the balance in the ecosystem gets disturbed if any of its component organisms are removed. What is biological magnification? Will the levels of this magnification be different at different levels of the ecosystem? Biomagnification is the increase in the concentration of pollutants or harmful chemicals within each step of the food chain. 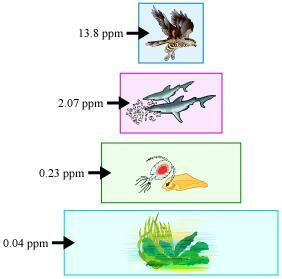 The levels of biomagnification will be different at different trophic levels. For example, in a pond of water, DDT was sprayed and the producers were found to have 0.04 ppm concentration of DDT. Since many types of planktons are eaten by some fishes and clams, their body accumulates 0.23 ppm of DDT. Sea gull that feeds on clams accumulates more DDT as one sea gull eats many clams. Hawk, the top carnivore, has the highest concentration of DDT. What are the problems caused by the non-biodegradable wastes that we generate? (i) Since the non-biodegradable substances cannot be broken down, they get accumulated and thus contaminate the soil and the water resources. (ii) These substances, when accidentally eaten by some stray animal, can harm them and can even cause their death. (iii) These substances occupy more space in the landfills and require special disposal techniques. (iv) These materials can accumulate in the environment and can also enter the food chain. If all the waste we generate is biodegradable, will this have no impact on the environment? Generation of only biodegradable waste will have a positive impact on the environment. There will not be any pollution caused by the non-biodegradable wastes. The problem associated with waste management and disposal will also not occur. The population of decomposers will increase to breakdown the extra biodegradable waste generated. Why is damage to the ozone layer a cause for concern? What steps are being taken to limit this damage? Ozone depletion occurs widely in the stratosphere. 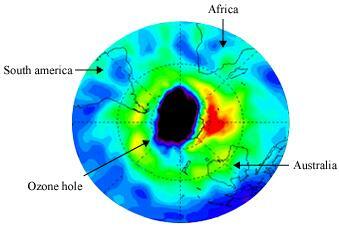 However, it is more prominent over the Antarctic region and is known as the ozone hole. It causes skin darkening, skin cancer, ageing, and corneal cataracts in human beings. It can result in the death of many phytoplanktons that leads to increased global warming. To limit the damage to the ozone layer, the release of CFCs into the atmosphere must be reduced. CFCs used as refrigerants and in fire extinguishers should be replaced with environmentally-safe alternatives. Also, the release of CFCs through industrial activities should be controlled.